The court of appeal opened this morning in Belize City; fourteen cases will be disposed of: six are criminal and the remaining eight are civil. The president of the court of appeal is Justice Manuel Sosa; the three justices will be joined by a fourth. Justice Christopher Blackman was today sworn in as a new Justice of the Belize Court of Appeal by the Governor General, Sir Colville Young, at the Belize House in the City of Belmopan. Justice Blackman has a distinguished legal career. He was a Judge of the High Court of Barbados from 1996 to 2000 and again from 2003 to 2008. 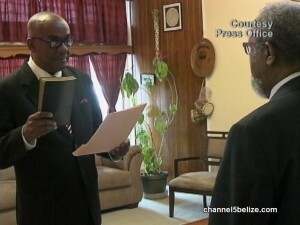 He also served as a Justice of the Supreme Court of Belize from April 2001 to May 2003. In March 2008, he became a Justice of Appeal in the Bahamas and is due to retire in December this year. The other Justices on the court of appeal are Denis Morrison, Justice Samuel Awich and Madam Justice Minette Hafiz.